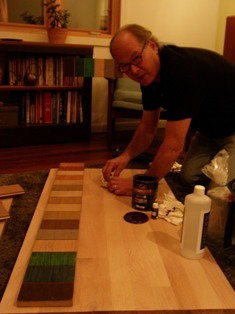 Mark Toveri and Monocoat, I would like to introduce you to The Wood Floor Conservancy community. Welcome and thanks for this interview. You're welcome Jerry. Sharing info is part of being a community. Mark, my readers want to know as much as they can about your product. Right off the bat, what web links would you recommend for the person looking for information beyond the scope of our conversation today? which is the importer's website. They maintain instructions, MSDS info, LEED points, etc. a good technical resource. Now, book learning is great, but your knowledge comes from first-hand field experience, does it not? Tell us about that. It really all started when my wife and I spent a week in Paris, France. Walking through the public buildings with old, really old wood floors which looked fantastic without a trace of poly. A few floors were so old the traffic patterns were dished out, yet the whole floor was beautifully maintained. I then decided that I wanted to learn and promote oiled floors. Sounds like you have experience with all kinds of floor finishes. 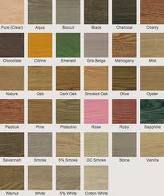 What makes Monocoat different from other "poly" type finishes? First, today's oiled floors are the high tech version of old tried and true technology. They work in partnership with the natural strength of wood. Wood is resilient. It bends and stretches and is nearly endlessly renewable, with just cleaning maintaining a finish. 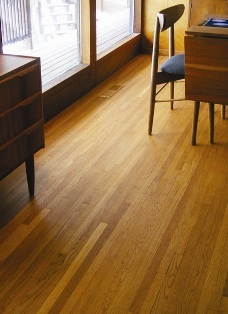 Natural oil finishes like Rubio Monocoat feed the wood what it likes to eat. Polyurethane on the other hand attempts to build a barrier between life and the wood. 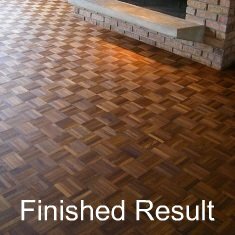 From your vast experience, Mark, is there a "best fit" out there for your wood floor finish? I mean, is there a species or an environment where it seems to be, by popular demand, the best choice? And if so, why? Technically, they designed Rubio Monocoat to seek out and bind with cellulose at the molecular level. Therefore, all woods are appropriate for the product, as well as cotton work pants. The high tech waxes bind with the molecules of wood and then harden in the first day and a half. The linseed oil that carries the waxes to the wood harden around those wood fibers. So together they form the water and stain resistant finish. In practice I have found that it is easier to work on an oak floor verses tight grained or rainforest oily woods. The open grain of oak allows a wider range of successful application techniques. The tight grain and oily woods need extra effort to remove the excess oil from the surface. Remember it bonds at the molecular level, which is not a thick build up of layers like a poly floor. Conversely, are there floor conditions or floor owners where this wood floor finish simply isn't what you would recommend? Yes, floors that have come to the end of their life. Old cracked, split or sanded past the nail heads floors which should be replaced can be held together with 3, 4, of 5 layers of poly. The thick poly layer will seal up areas that could produce slivers, or snags. All floors will have a few boards split so I crawl through the whole work area on all floors and repair anything that could turn into a snag. If someone out there is getting quotes for floor finishing, what can they expect for a difference in price between Monocoat and other poly-type finishes? I charge the same price for a Rubio Monocoat floor as a polyurethane floor. I suppose some people would want a discount because I spend less time in there home. But when I use Rubio Monocoat it also means they get to spend more time in their home. The main reason I stay away from different prices is because as soon as you start talking money many folks are influenced by greed. Money clouds their judgement. The real decision is do you want a plastic floor or do you want a wood floor? Mark, I know you have a lot of inquiries from folks who want to "go green". Why are Rubio products "green"? All the ingredients are natural and plant based. The technical info at monocoat.us provides a better answer than I can. What I can report is that as a floor guy I want a product first off that is not going to harm me. Using a kinda green product everyday means I get exposed to a bunch of bad stuff every year. Using a Zero VOC product keeps the headaches away which I get from Polyurethane and I always wear a charcoal filter mask. Second, green means a healthy home for my customers. Third, Rubio floors just require touch ups in the future rather than grinding off that plastic polyurethane and filling the land fill with a combination of plastic dust and a good portion of your floor. How do you go about color matching? With 30 plus colors available, all of which can be blended, the options are endless. My first recommendation is to pick one color which makes future maintenance and repairs less complicated. However, I am actually a big fan of blending because I find a variety of pigments in the surface reflect light differently which brings floors to life. 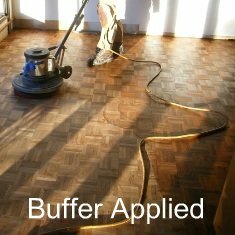 What is involved in maintaining a Monocoat floor? A dry electrostatic mop is the best daily cleaning. Rubio Monocoat makes a very good soap which is mild yet a strong cleaner, so damp-mopping is possible, as necessary. Over time traffic areas will need to be touched up with Rubio Monocoat Refresh, which is buffed on and buffed off. Refresh is used when the floor starts to show dull traffic patterns. Maintenance oil, which comes in colors is used as time has passed and the floor has started to lose color in the traffic pattern. How often are these steps taken? Depends really on the family. My parents in their 80's probably never. My brothers family with energetic kids, two dogs and three horses, probably every 4 years. Touch up bottles are available and I ask my customers if an event happens and a scratch appears touch it up. Then twice a year wash the floor and then seek out any micro scratches to touch up. This is an easy task and pleasant - remember Zero VOC. Mark, I know you are a very busy man. Thank you, again, for your time. In closing, is there anything else you would like to add? Practice using the Rubio Monocoat before your first job. It is simple to use but old habits must be ignored which is hard to do. I have caught myself saying ok this is a back entry heavily used so I better get a thick coat. Wrong, a thick coat will never harden correctly. Remember molecular binding. A good analogy is the carpet cleaner. A poor cleaner thinks more water means a cleaner carpet. A pro cleaner knows the work is not putting the water down. The skill is getting the water and the dirt up out of the carpet. Consistent coating with Rubio Monocoat is an important step in the application. But the important step is removing all the excess oil that has not bonded with the wood. I find the process simply enjoyable.